We are now more than a month deep into the most wonderful time of the year: Football season. Yes, I know the boys of summer still occupy their dirt diamonds with dreams of championships, and many a fan still pays homage to the baseball gods. But for me and mine, baseball is not our favorite pastime. It is a game that merely passes the time until the shoulder-padded-gladiators enter the arena. And now that these warriors have indeed renewed their pigskin skirmish, my family is consumed by it. We go to the Friday night high school game. We watch college ball on Saturdays and the NFL on Sundays and on Monday nights (sometimes on Thursdays). We even have a family fantasy league and the occasional in-house wager (my wife usually wins). Yet, all religions have hang-ups – even my beloved game of football – and the worst of these is the excruciatingly slow pace of play late in the game. Do not be deceived when you see less than two minutes on the football game clock. It will take half an hour to play out that much time. Why? Well, there are timeouts to be taken, consultations on the sidelines that stop the clock, instant replay reviews by the officials, and of course the huddle. The team circles up over and over again like a wagon train under siege. All this circling and scheming stretches out time like a rubber band. Now, this is not wasted time. When the team huddles it is preparing itself to execute a play. The huddle is the means to that end. In act, the only reason a team takes the time to huddle in the first place is to ready itself to play the game. 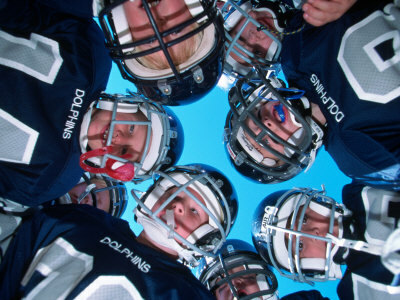 Wouldn’t it be a shame for we who love the game if football was nothing but a huddle; a meeting to talk about playing, but never involved actually snapping the ball? It wouldn’t be much of a game. Isn’t it a shame when Christianity devolves into the same? On Sunday mornings many of us charge out of our locker rooms suited up in our best clean and pressed uniforms. We sing our fight songs and wave our banners. We even tailgate together down at the buffet line. We gather in our holy huddles to plan and plot, but most of us never actually play. That we have fulfilled our religious duty of going to church, that we attended the weekly pep rally seems to be enough for the team. But what happens inside our sanctuaries and houses of worship week after week, while important, is not where the “game” is actually played. Our weekly gatherings are more like locker room speeches. They are weight rooms that strengthen our spiritual muscles. They are rehab facilities in which we can get healthy. They are nutritional centers to feed our hungry bellies. But when our muscles are strong, our wounds bandaged, our appetites sated, and our motivation roused, we have to leave the huddle and get out there on the field where the game is actually played. Where people are hungry, thirsty, naked, sick, abandoned, and mistreated; where people are hurt, confused, in need of friendship, love, and redemption – that is the field of play for people of faith. That is where the words spoken inside the huddle are translated into action on the turf. So it really doesn’t matter how long, how often, or how eloquent our holy huddles are. What matters is this: When we break the huddle have when been empowered to actually deliver on the field? So while there is still time on the clock, let’s play the game.